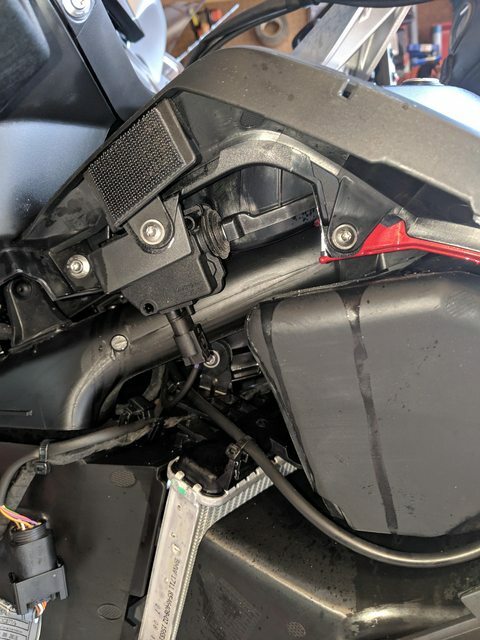 BMW Luxury Touring Community > BMW Bikes > RT Series > '19 R1250RT: Factory Velcro on Fairings? '19 R1250RT: Factory Velcro on Fairings? Starting my first installation on my new R1250RT this morning: a set of Denali D4s and CanSmart controller. Taking the fairings off to install the brackets I was trying to be extremely careful not to break the dreaded tabs. I found the two posts in rubber grommets and gently popped them out, and tried lifting up and back gently but the panel wouldn't budge. I pushed, tugged, etc. fearing I would break the tabs. Suddenly it popped and I was sure I snapped a tab. I hadn't - all tabs are intact, but there was a square of Velcro on the back that no post I had ever read mentioned. So my question: is this a new factory feature or a dealer-added surprise they forgot to tell me about? Anyone else with a 1250 experience this? Guessing by the sloppy positioning on the inside of the fairing panel, I'm betting this was a dealer add. As I said, tabs are intact on both sides so it's not because someone broke tabs during assembly. My late 16 also has them. I ended up adding another in a location close to my broken tabs on my left side, to keep the rear top corner down. Re: '19 R1250RT: Factory Velcro on Fairings? That's good to know. I guess it's a "feature." Yes we talked about it here a bit ago. 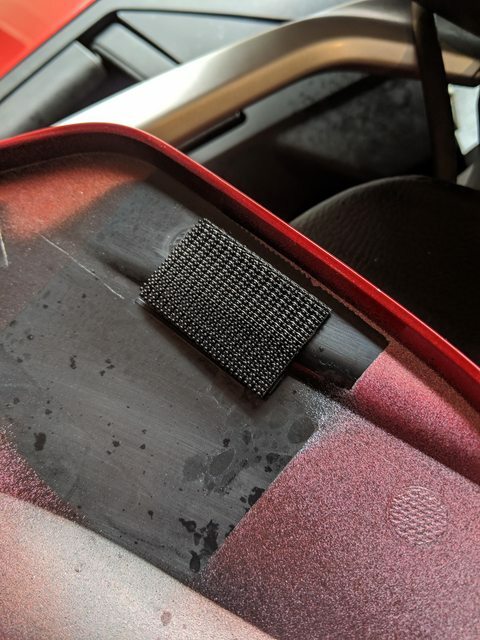 Yeah, it's BMW's crummy "fix" for the lousy tabs that we were complaining about ever since when the wethead RT came out! I still give the credit of using the velcro to hopz (member of this board) who used the idea to take care of the broken tabs on his (then) new '14 wethead! The really annoying thing about that particular episode was that the tabs were broken by the dealer who refused to owe up to doing it, even though they were the only people who had worked on the bike at the time! I think the crummy part is that it isn't obvious how to remove and replace the panels so that they aren't compromised. Once you understand how they work they are really perfectly adequate to do what they do and they won't break. IOW, they're not all that fragile, but because of how they're employed it's easy to apply leverage and snap one or two off if you're not certain how to grapple with them. Because of stories about this issue when I bought my '16 new I asked the dealer's senior BMW certified mechanic to demonstrate to me how to R&R the fairing panels and he summarily broke both tabs off on one side during the demonstration--he simply FIRST pushed the pins into their grommets, then he took the heel of his hand and smashed the top towards the fuel tank, as if the tabs were nubs that needed to be snapped into place. They ordered the paint-matched replacement. I'm sure he never made that mistake again! But as we have established by 15 they were putting Velcro (dual lock) on some RT's and later RT's to follow. I did/do not get it. I mean fairing screws all over the place why not two there instead of tabs? It is in fact a very poor design as far as accessing behind that panel. Yes it holds the panel but is a piss poor design no matter how much lipstick you put on it. Hey, I wouldn't be surprised at all if they do monitor these forums!!! BTW, all of my tabs are intact still. It's not hard to make sure that they aren't under stress when taking the panel off. OTOH, I am afraid that the velcro would make me put too much efforts into getting the two parts disengaged and therefore accidentally break the tabs! Oh, well, we shall see when I get my 1250!